Congress has passed a bill that will require food companies to disclose GMOs — but without necessarily using a GMO label on packaging. Companies would have several disclosure options, including using a QR code on packaging that customers could then scan with a smartphone to learn more. (Above) A sign at a July 1 rally in Montpelier, Vt., protests the bill. After years of bitter debate and legislative stalemate over the labeling of genetically modified ingredients, a compromise proposal sailed through Congress in breathtaking speed over the past three weeks. The House of Representative passed the measure on Thursday with solid support from both Democrats and Republicans. It now goes to the White House, where President Obama is expected to sign it. Within a few years, consumers will be able to find out whether any food in the supermarket contains GMO ingredients. But they won't necessarily see that information on the package. Instead, consumers may have to scan a "QR code" — those little square codes that you see on airline boarding passes — to get that information. Neither side in the labeling battle sounded completely satisfied. "I don't think that it's the best bill that we could have, but it's the best bill we could pass," says Richard Wilkins, a Delaware farmer who is president of the American Soybean Association, which opposes mandatory GMO labels. "We're not supporting the final bill, because it does allow companies to use the option of a QR code," says Scott Faber, from the Environmental Working Group, which supports mandatory labels. Congress was forced into this compromise by Vermont, which passed its own GMO labeling law. It went into effect this month. Faber says mandatory labeling is necessary in order to provide consumers the information they need to ensure "that their values are reflected in their food dollar." Food companies and farm groups, meanwhile, are convinced that pro-labeling groups are simply trying to use labels to drive consumers away from GMOs — a tactic that worked in Europe. "Their first step was to require a mandatory label, and their second step was to force those products out of the marketplace," Wilkins says. Wilkins also says mandatory labeling of GMOs suggests that those foods are inferior or unsafe, which is simply not true. The U.S. Food and Drug Administration has said labeling isn't necessary because GMO foods aren't any different than regular ones. This is why food companies and farm groups lobbied Congress to ban mandatory GMO labeling laws, including the one in Vermont. That previous proposal passed in the House, but not the Senate, where Michigan Sen. Debbie Stabenow — the ranking Democrat on the agriculture committee — dug in her heels against it. 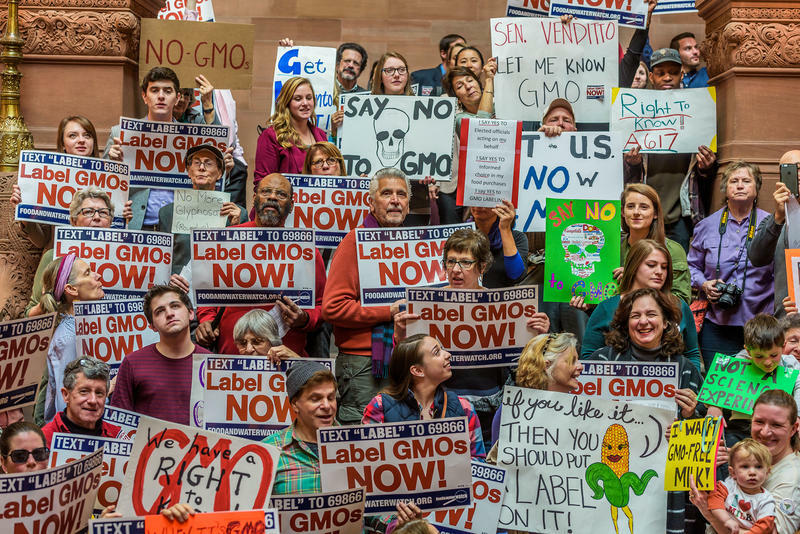 In the end, the two sides settled on a compromise that does nullify Vermont's law, but still requires a form of GMO labeling. Under this compromise, food companies will have to reveal whether products contain GMO ingredients, but they won't have to print it on the package label. Instead, they can make that information available through a QR code. Shoppers would have to scan it with their smartphones. Small food companies also have the option of printing a website URL or a phone number that customers can call for more information. The proposal opened up sharp divisions among groups that had previously presented a united front in favor of GMO labeling. Some critics condemned the compromise as a "betrayal," a "sham" and "inexcusable." Yet the Organic Trade Association, which supports GMO labeling, decided to support the compromise, in part because the law includes some special benefits for the organic industry. It includes, for instance, a provision that allows organic food companies to label their products as non-GMO. The Just Label It coalition, which includes the Environmental Working Group and a long list of food companies, declared the bill a victory of sorts, even while refusing to support it. "It's not an insignificant achievement that a Republican Congress has decided to mandate a national GMO disclosure on every food package that contains genetically engineered ingredients," says Scott Faber. At the same time, the GMO labeling battle isn't over. For one thing, the law leaves many details of the new labeling scheme to be worked out by the U.S. Department of Agriculture. These include, for instance, whether refined products like soy oil or sugar from beets will need to be labeled. While they are made from GMO crops, the final product doesn't contain any genetically modified material, such as proteins or DNA. Gary Hirshberg, chairman of the Just Label It coalition, released a statement sayin that "the fight for national mandatory GMO transparency now shifts to USDA and to the marketplace, where companies should think twice before they remove GMO labels from their packages." 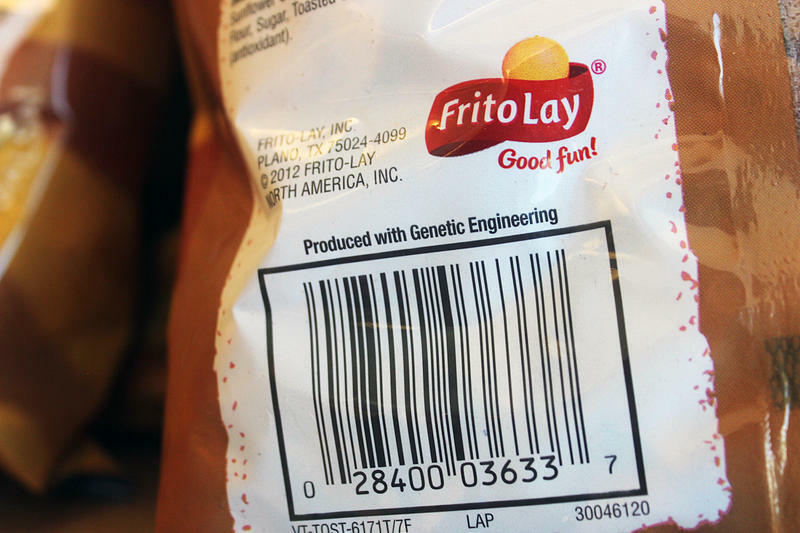 Now, more on that bill about genetically-modified food. It is a compromise on a hotly-debated issue, and neither side is completely happy with the outcome. What it means is that a couple of years from now, consumers will be able to find out whether packaged goods contain genetically-modified ingredients. NPR's Dan Charles reports. DAN CHARLES, BYLINE: For years, groups opposed to GMOs have been pushing for laws that would require a label on foods that contain ingredients made from genetically-modified crops, like corn or soybeans. Scott Faber from the Environmental Working Group, which wants GMO labels, says consumers need that information to help them choose what foods to buy. SCOTT FABER: If we don't give consumers basic information, they're not able to ensure that their values are reflected in their food dollar. CHARLES: The state of Vermont went ahead and passed its own GMO-labeling law. It went into effect this month, and that law forced the issue in Congress. 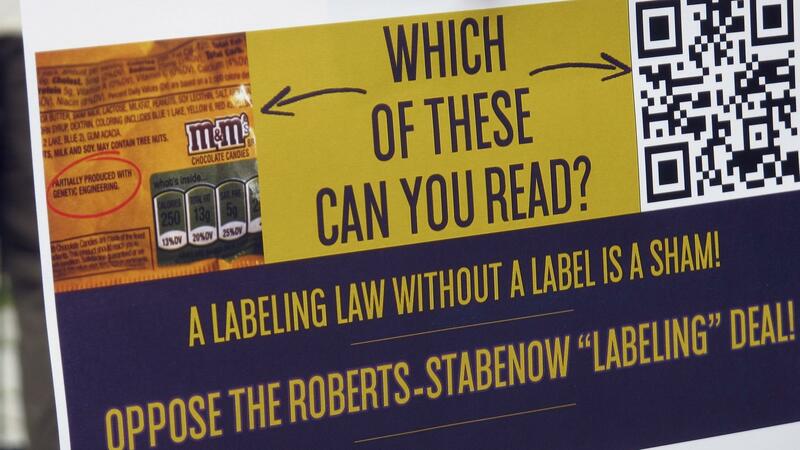 Big food companies and farm groups have been fighting back against proposals to require GMO labeling. Richard Wilkins, who is president of the American Soybean Association, says anti-biotechnology activists just want to use labels to drive consumers away from GMOs. He says that tactic worked in Europe. RICHARD WILKINS: Their first step was to require a mandatory label, and then their second step was to force those products out of the marketplace. CHARLES: Wilkens says mandatory labeling of GMOs suggests that those foods are inferior or unsafe, and that's simply not true, according to the U.S. Food and Drug Administration. Food companies and farm groups lobbied Congress to stop any mandatory GMO-labeling laws, like the one in Vermont. That proposal passed the House, but not the Senate, and the two sides then settled on a compromise bill. It does nullify Vermont's law, but it still requires a form of GMO labeling. Under this compromise, food companies will have to reveal whether their products contain GMO ingredients. But they won't have to print it right on the package label. Instead, they can make that information available through a so-called QR code, those little square barcode-type things that you see on airline boarding passes. Shoppers would have to scan it with their smartphones. This bill has now passed Congress, and President Obama is expected to sign it. The U.S. Department of Agriculture will write the rules for these new labels. But the GMO labeling battle is not over. Scott Faber says the battle will shift from Congress to the marketplace. His pro-labeling coalition will try to mobilize consumers and continue to demand that companies print those GMO details right on the package. Dan Charles, NPR News. Transcript provided by NPR, Copyright NPR. It's been called "perhaps the most contentious issue in the food industry": Should food products be labeled to indicate they contain genetically modified ingredients? The U.S. Senate on Wednesday took the first step to pass legislation that would overturn Vermont's law that requires the labeling of food that contains genetically modified ingredients. The proposed federal bill would prohibit individual states from enacting their own GMO labeling standards. Connecticut lawmakers have passed a “first-in-the-nation” law, mandating the labeling of Genetically Modified Organisms or GMOs in food products. It’s headed to the Governor for his signature, but that doesn’t mean it goes into effect anytime soon.